Last week I posted about some unfortunate food incidents, so I wanted to post about some good food things here as well, focusing of course on vegetarian fare. First up, artichokes, or as they are called here: alcachofas. 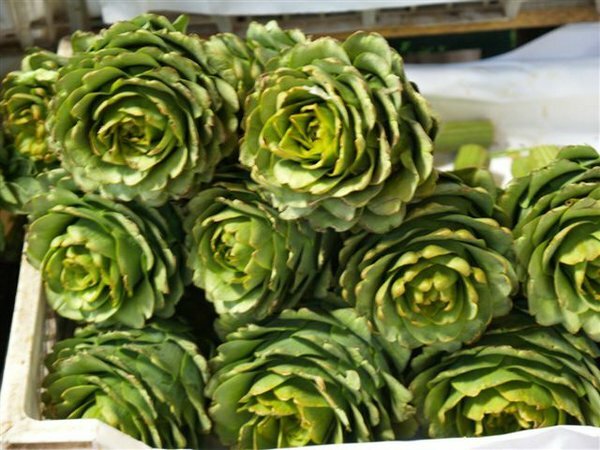 In the US, I generally thought of artichokes as a rarity, an unusual food that you know about but don't frequently have occasion to buy. In Chile, it is a very common vegetable - you even see vendors in the streets walking around to cars at stoplights selling them. They also look a little different, with the leaves open instead of closed in a point. I think they are much prettier, though they taste about the same. They are MUCH cheaper though - we just bought 3 for $2 at the market this weekend (I think they are often $2 each or more in the US). Even Caroline has taken a liking to them. We mostly just steam them and then peel the leaves and dip them in garlic butter as a snack. Next up, pebre! This is basically chilean salsa, but it's different enough from standard American/Mexican salsa that it tastes like it's own thing. It's the usual ingredients - tomato, onion, cilantro - but then mixed in with something called ají crema. This is like a hot sauce made from the ají pepper. I think it tastes kiiind of like buffalo sauce, but it isn't buttery. It is, however, delicious, and pebre is some tasty salsa! You can make it with extra fuerte (strong) ají crema, but then it really packs a punch! We also eat a TON of avocados here. When you go to the grocery store or market, you can clearly see that avocado (along with tomato) is the dominant produce item in the food here. They have like five display racks of avocados next to each other - it's waaaay more than you see in the US (except maybe in California?). They even have sections of "ready today" and "ready in 2-3 days". We have been eating them on sandwiches, as guacamole, as a sort of bruschetta, and it's great! The price at the market was about $1.40 per pound! We got 3 huge ones for about $2.50, not bad. I will do a complete post about the market (La Vega) sometime, but for now I just wanted to share one other picture. The celery here is enormous! I'm not sure if this photo really conveys the scale, but I made sure to get my hand in the picture so you could see how big the celery is. Finally, we did find an Indian restaurant on Friday night. It was sort of fun to see the menu there, because all the descriptions of the dishes were in spanish, but the names were the same Indian names we knew, so it was easy to order. That's all for now! More food posts in the future, I promise, along with a complete photo tour of La Vega. By the way, for those of you in California, are these produce prices normal for you? What do you pay for avocados?